Activision has revealed a new trailer for Call of Duty Black Ops 4 Zombies, this time covering the catalyst to the story of the Blood of the Dead episode. It involves the old team of Dempsey, Takeo, Richtofen, and Nikolai heading over to Alcatraz Island, and ending up in less than ideal circumstances. There’s magic, dark forces, and, of course, hordes of the undead. After the previous COD Black Ops 4 Zombies trailer, which focused more on episodes Voyage of Despair and IX, Activision has released a story trailer for episode Blood of the Dead. And, wouldn’t you know it, it’s just as convoluted and bizarre and lovably silly as the other two. Blood of the Dead is going to take your old friends, Richtofen, Dempsey, Takeo and Nikolai, to Alcatraz Island. There, something happens with a doctor that may or may not have a twin or doppelganger and a magic book and oh who cares, zombies are in Alcatraz, go and kill them! No, but seriously, I know that most people don’t care about the story in Call of Duty, especially Zombies; you’re just there to blast the everloving snot out of the undead. But, I have to admit, between this trailer and the previous one, I’m kinda curious about the whole thing. It seems pretty Lovecraftian in nature, if with a cheesy, B-movie kind of vibe, and I like that kind of stuff. And, considering that both trailers feature some sort of arcane magic, I wonder if all of the episodes are connected in some way, and how. I guess we’ll have to wait and see when Zombies comes out. 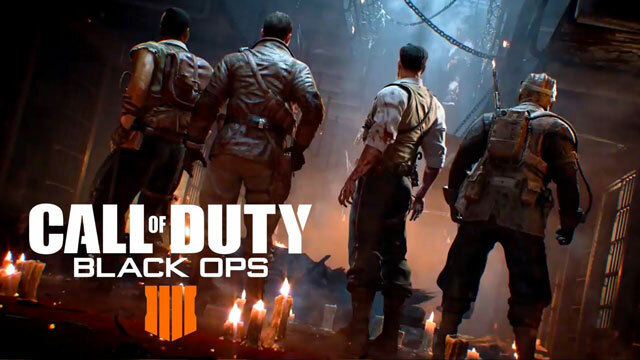 Call of Duty Black Ops 4 Zombies is going to come out on October 12th. You’ll be able to pick it up on Xbox One, PlayStation 4, and PC.